The Palace of Fine Arts, with its peaceful lagoon set against the dramatic backdrop of Roman arches and a large rotunda, evokes images of classical European architecture. Built for the 1915 Panama-Pacific exposition to display art, it looks like it has been aging in place for much longer. The Exploratorium, located at the Palace of Fine Arts, juxtaposes scientific exploration against the artistic milieu of the Palace. A favorite place for picnics and wedding photographs, the bucolic setting provides a respite from the busy pace of urban life, and has long been a popular relaxation spot for locals and tourists alike. A large lawn bordering the lagoon is home to white swans, adding to the photogenic nature of the location. Attending an event at the 1,000 seat indoor theater on site, no matter how minor, always seems more grandiose in the majestic setting. The Palace of Fine Arts is a magical place at night, too, all dressed up in pretty lights. If you are following my Golden Gate Bridge itinerary, a short detour from the Marina Green or Crissy Field will put you at the Palace of Fine Arts, and, depending on your timing and whether it’s a sunny day, could be an ideal place for an alfresco luncheon (pick up supplies at the Marina Safeway, located across the street from Fort Mason, where the Golden Gate Bridge itinerary begins). From the small marina between the Marina Green and Crissy Field, cross Marina Boulevard at Lyon Street. 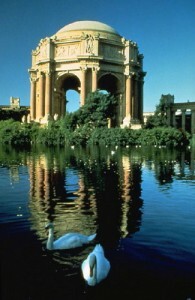 The Exploratorium, a small, science-oriented museum that opened its doors in 1969, is located on the Palace of Fine Arts property and is a popular with families. It has an interesting history, being the brainchild of Frank Oppenheimer, brother of J. Robert Oppenheimer, known by many as the “Father of the Atomic Bomb” due to his work on the government-backed Manhattan Project in the 1940’s. Frank, like J. Robert, was also a brilliant physicist and was drawn to San Francisco later in his career where he became enthralled with the idea of creating a unique, hands-on museum to educate people about science. The Palace of Fine Arts provided a large, empty space to seed the concept, though now the museum is bursting out of its confines, and suited Frank’s philosophy that art and science complement each other. The Exploratorium offers numerous touchable displays designed to engage, entertain and teach through experiencing the physical world. Topics include astronomy, the earth, the human body, living things, culture, seeing, listening and everyday science. Exploring the grounds around the Palace of Fine Arts and visiting the Exploratorium is a pleasant way to spend a few hours away from the more commercialized tourist attractions in San Francisco. Who knows? 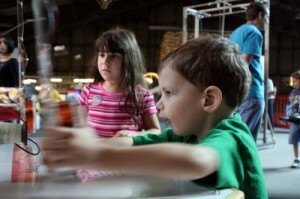 You might even learn something you didn’t know before at the Exploratorium. See related articles on San Francisco, and the Golden Gate Bridge in Striped Pot Magazine. Admission $10-15, depending on age. $5 more if visiting the Tactile Dome, a place to explore the world of complete darkness.